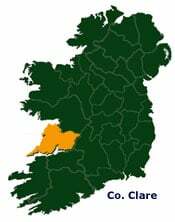 One of Ireland’s premier tourism counties, Clare has an abundance of visual riches from the famous river Shannon and Lough Derg, which forms its eastern boundary, to its rugged Atlantic coastline with its towering cliffs and golden beaches in the west. Bunratty, Lahinch, Lisdoonvarna and Doolin are some of the town names associated with fun and enjoyment in the area. Attractions include The Burren National Park, Cliffs of Moher, Aillwee Caves and Bunratty Castle & Folk Park.